An artificial insect eye that could be used in ultra-thin cameras has been developed by scientists in the US. The dimpled eye contains over 8,500 hexagonal lenses packed into an area the size of a pinhead. The dome-shaped structure, described in the journal Science, is similar to a bee's eye. The researchers, from the University of California, Berkeley, say the work may also shed light on how insects developed such complex visual systems. "Even though insects start with just a single cell, they grow and create this beautiful optical system by themselves," said Professor Luke Lee, one of the authors on the paper. "I wanted to understand how nature can create layer upon layer of perfectly ordered structures without expensive fabrication technology," he said. As a result, the team of bioengineers came up with a relatively cheap and easy method for creating the artificial eyes that may in part mimic natural processes. 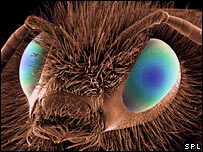 Insect eyes, known as compound eyes, usually consist of hundreds of tiny lens-capped optical units, known as ommatidia. For example, a dragonfly has 30,000 of the structures in each eye. Individual ommatidia guide light through a lens and cone into a channel, known as a rhabdom, which contains light-sensitive cells. These are connected to optical, nerve cells to produce the image. The ommatidia are crammed side by side into bulges that create a wide field of view for the insect. As each unit is orientated in a slightly different direction, the honeycombed eye creates a mosaic image which, although low in resolution, is excellent at detecting movement. The team created the artificial eye by first creating a tiny, reusable mould with 8,700 indentations. The pock-marked hemisphere was then filled with an epoxy resin that reacts when exposed to ultraviolet light to create a harder material with different chemical properties. After being baked at a low temperature to set the material it can be extracted from the mould. The result is a pin head sized dome with 8,700 raised humps arranged in a honeycomb pattern across its surface. Each raised hump acts like a lens, focusing any light into the material below. Over time the concentrated light reacts with the resin to form a cone that guides the light deeper into the structure. As the light continues to burn a path through the resin it creates a tiny channel, called a wave-guide, which is similar to the rhabdom in an insect's eye. The reaction of the polymer with the light changes the optical properties of the material meaning that all light that enters the wave-guide is channelled along its length. The result is a tiny resin dome, covered in lenses and pierced by perfectly aligned wave-guides that channel light through the centre of the dome. As the channels are created as a direct result of light falling on the lens, the researchers believe they could gain insights into the order in which these structures originally formed in insect's eyes. "To me it makes more sense to have a lens first," said Professor Lee. "I don't think that you formed the visual nervous system first and then it fanned out." At the moment, the artificial eye is not connected to any kind of imaging device. However, it could be attached to an image sensor, similar to those used in a digital camera, to complete the setup. This would allow the eye to be used in tiny, omni-directional surveillance devices, ultra thin cameras or for high-speed motion sensors. America's military research group, the Defense Advanced Research Projects Agency (Darpa), is interested in the eye and funded some of the research. Professor Lee also thinks it may have medical applications such as imaging the gut. "You would swallow this tiny system that also has wireless communication capability," he told the BBC News website. "So while you are getting these wonderful images inside the body they can be transmitted back outside." Even further down the line, Professor Lee believes that the work could help develop artificial retinas for the blind. "This is our future goal" he said.